Corfu, or, in Greek, "Kerkyra," feels different from most other Greek islands from the moment you step off the boat. There are at least 3 good reasons for this. One, its history differs from that of much of Greece in that Corfu, like most of the islands off Greece's west coast (the Heptanese or "Seven Islands"), has had a strong Anglo-Venetian presence during its relatively recent history. The influence of this history is immediately reflected in its distinctly Italian-flavored architecture. Secondly, Corfu completely escaped the oppressive effects of Ottoman Turkish rule during its nearly 400-year occupation of most of the rest of Greece. Therefore, it belongs, as no other place in Greece, to the West, rather than to the Levant. Thirdly, the island's climate is different than that of the Aegean islands. It's a bit more rainy in the winter. This, combined with the fertile soil, gives Corfu a much greener aspect. Corfu is one of the most popular islands for Europeans, especially British, not only because Britain ruled it for a period in the 1800's, but also because it is the closest Greek island to the rest of Europe. It is home to many ex-patriots. 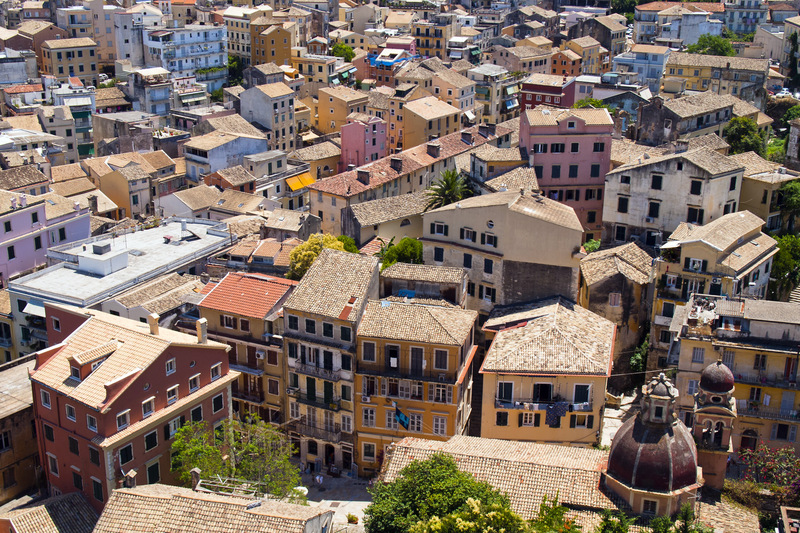 It is estimated that up to 10% of Corfu's 130,000 inhabitants are ex-pats, mostly British. 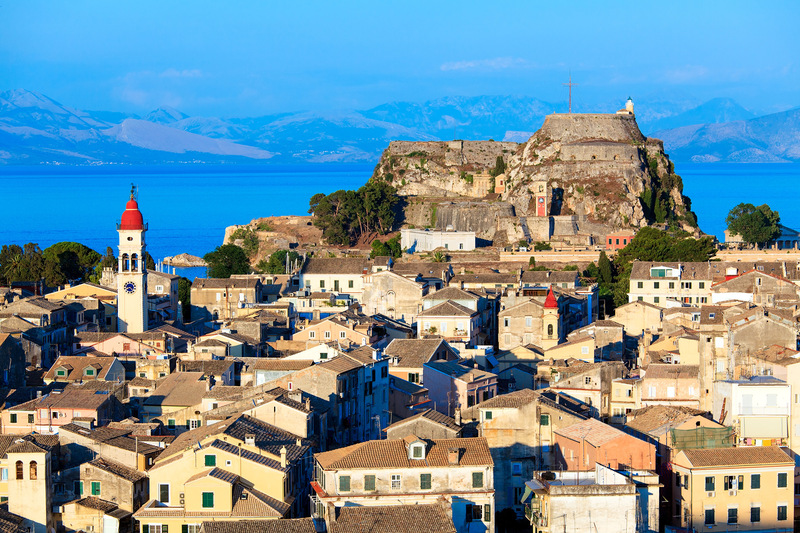 Second-largest of the Ionian Islands, Corfu is shaped roughly like a reverse comma. It is wide and hilly in the north, and narrow and somewhat flatter in the south. There is no spot along its 40-mile (65 km) length that is more than 7.5 km from the sea. Corfu is one of Greece's most beautiful islands, with a highly developed tourist infrastructure along its coastal areas. At the same time, the inland portions of the island are relatively unchanged by the thousands who visit every year. Topographically, its eastern coast features a more or less gentle downgrade to the seashore, while the western shore has a lot more cliffs and dramatic, sudden drop-offs into the Ionian sea, along with numerous coves with sandy beaches. Its highest point is Mt. Pantokrator, at 915 meters, in the center-north. 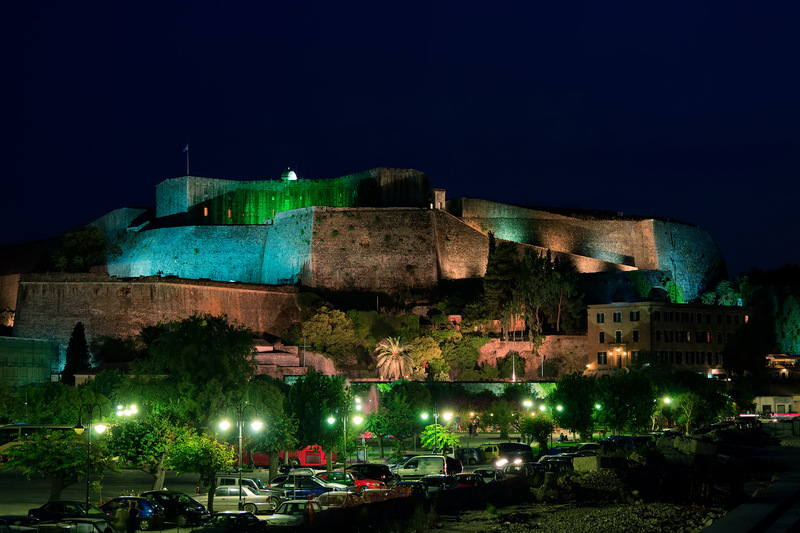 The name "Kerkyra" was first mentioned by the Mycenaeans in 1300 BC. Jason and the Argonauts were said to have visited, where Jason is supposed to have married Medea, granddaughter of the sun God, Helios, in "Medea's Cave," on Gamillio (wedding) Mountain. Kerkyra was the name of the daughter of Asopos, the river god. Only the Greeks use the name Kerkyra, "Corfu" being the name the rest of the world uses. "corfu" is probably a corruption of the Greek word "korifi," meaning "summit," which in turn was named after the promontory that Corfu Town was built on, in the 7th century AD, by the Byzantines. There is evidence of the island being inhabited as early as 30,000 BC, based on artifacts found in a cave in Gardiki in the southwest. The Illyrians (now Albanians) had established a colony there in the 800's BC, before being displaced in 750 by the Eretrians, who came from Evia, the large island off of Greece's east coast. Just 15 years later the Corinthians drove off the Eretrians, and used Corfu as a beachhead to colonize further west, in Sicily. In 665 BC Corfu fought Corinth in what was the first recorded sea battle in Greece. Eventually Corfu earned independence, and turned to mercantile pursuits. During the 5th-century BC Persian Wars, Corfu had a fleet of 60 ships, second only to Athens. In 480 BC, Corfu reacted slowly to a request by Athens to send her fleet south for the battle of Salamis, and did not participate, for which she was roundly criticized by the Athenians. Corfu aligned with Athens against Sparta and Corinth for the Peloponnesian wars, which began in 433 BC. Corfu was conquered by the ascendant Romans in 229 BC and used as a naval station. Many Romans settled there, building villas and establishing agrarian estates. The island was visited over the next few centuries by Emperors Nero, Tiberius, and Augustus Caesar, and by Cato, Cicero, and Mark Antony. In 336 AD, Corfu passed into the hands of the Byzantine empire. Under the Byzantines, Corfu remained relatively stable for the following nearly 650 years. Beginning in 1081, Corfu fell into the hands of various Sicilian and Italian-based powers, (including over a century of rule by the Sicilian-based Angevin family dynasty founded by Charles d'Anjou). The island passed into the orbit of Venice for an extended period of time in 1386. During this time Corfu's religious identity was temporarily changed from Eastern Orthodox to Roman Catholic. Around 1360, some of the first Romani, or Gypsies (who originated in pre-Christian India) in Europe were living as serfs on a fiefdom called Feudum Acinganorum in Corfu. The Venetians stayed until 1797. The island underwent a number of improvements during this time, including the planting of more than 3 million olive trees. 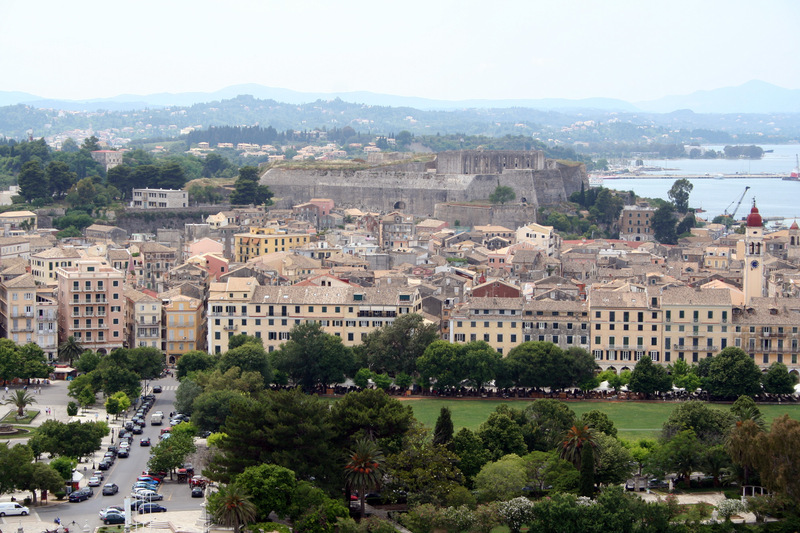 A great deal of civil and military construction also took place, particularly in Corfu Town. The town had, gradually, starting about a thousand years previously, become the capital city, having been moved from the less defensible Paleopolis (Old City), just a few kilometers south and near the modern airport, where its ruins can now be visited. Because of its strategic location, Corfu was a much desired and much fought-over place, and has many castles and fortifications throughout its length. Two of these castles bookend Corfu Town, making it the only city in Greece thus protected. During Venetian rule, Corfu served as a last line of defense against Ottoman aggression into the Adriatic and the rest of Europe. It was one of the most heavily fortified places on the continent. Corfu successfully withstood multiple Ottoman sieges, and never fell. During this time, Corfu became a refuge for Greeks fleeing the Ottoman occupation of the mainland, and a beacon of learning and western culture. The entire village of Parga, across the strait from the southern end of Corfu, picked up and moved to Corfu when the Ottomans came. Corfu was peacefully transferred, along with the rest of the Heptanese, to Great Britain in 1815. In 1864, it was handed over to Greece. Despite some tensions between the locals and the British rulers (The first British High Commissioner, Thomas Maitland, was nicknamed "Ektrosis-" "The Abortion-" because of his rudeness and bad personal hygiene), the Brits were responsible for a greatly improved road system and a stable water supply. Corfu became a favorite holiday destination of European royalty. Austria's Empress Elizabeth, popularly known as "Sisi," built a large estate, the Achilleion, south of Corfu Town, which is now a tourist attraction. Germany's Kaiser Wilhelm II was also a frequent visitor. Serbia's exiled government found a home in Corfu in 1916. The Italians occupied Corfu during the early part of WWII, until the Germans took over in September, 1943. They promptly rounded up the island's 1900 Jews and sent them to their deaths. The modern tourism era began in the early 1950's, and expats began buying property. Tourism replaced agriculture as Corfu's main source of income, although the recent economic downturn which began in 2008 has not been kind to either industry. The capital city is much more Italian than it is Greek, due to the over 400-year presence of the Venetians. There are also remnants of British, French, and ancient Roman occupation in addition to the original Greek settlers, which contribute to its Western, cosmopolitan atmosphere. It was here that the first modern Greek university was founded, as well as the first Philharmonic Orchestra, and the first School of Fine Arts. The Old Town was built on a rise of ground on a peninsula jutting into the strait between the island and mainland Greece, about a third of the way down from the island's northern end. The town sits sandwiched securely between two forts; the "Old Fortress" on the east and the "New Fortress" on the west. It was heavily bombed during WWII, and its wall system was mostly dismantled in the late 1800's, when walled cities were no longer defensible. The roughly circular-shaped Old Town is only about 500 meters in diameter, making it very pedestrian friendly. It features monumental architecture, narrow streets (known locally as "kandounia"), and fountain-punctuated, compact squares tucked away in its "kandounia." The addition of several thousand university students to the local population of about 30,000 gives breathes new life into the old city. Between the Old Fortress and the Ionian University, which occupy a smaller, narrower peninsula jutting out further to the east from that on which the town is located, is an oblong-shaped green area of about 500 meters north-to-south, and 150 meters east-to west which occupies fully a quarter of the town. The entire area is known as the Spiniada, from the Spanish word "Esplanade." It is bisected by an east-west roadway along which travel horses and carriages in addition to regular traffic. North of the road it is called Platia Enosis (Unity Square), and south of the road it is called Leonida Vlachou Square, named after a 19th century lawyer and benefactor of the city. It is the largest open square in Greece, an area of mixed pavement, grass, and ornamental vegetation. The French are responsible for its elegant landscaping. There are a number of monuments in Vlachou Square, including a monument celebrating the unification of the Heptanese on May 21, 1864 (and their unification with mainland Greece), a very nice fountain, and an impressive peristyle monument to the already mentioned rather unpopular First Lord High Commissioner, Thomas Maitland. Just to the west of Unity Square is Eleftherias Street, a long, wide, north-south paved walkway which has hundreds of tables and chairs for outdoor dining and drinking during warm weather. Just west of that is an arcade enclosed by a series of columns and arches, almost an exact copy of the Rue de Rivoli in Paris. The cafes that are housed under these arches, whose waiters serve the customers seated in the hundreds of tables and chairs on the Eleftherias Street, are extremely popular. The tables overlook the lawn of Unity Square, where cricket matches used to be played during British rule. The Old Fort was first built by the Byzantines in the 6th century. The Venetians improved upon it. The British dismantled much of the Venetians' work before handing it, and the island, over to the Greeks in 1864. The Venetians dug a 300-meter, north-south channel, called the Kontrafossa, through the neck of the peninsula the fort is situated on, effectively creating a small island whose only access was a narrow drawbridge. The modern bridge is steel, and has a small gatehouse which houses some very well-preserved Byzantine-era mosaics and frescoes. Just to the north of the Spiniada is the Palace of St. Michael and George, a massive three-story building with a covered porch supported by Doric columns running the entire width of its facade. The Greeks call it the "Palia Anaktora (Old Palace)." There is a man-made circular pool in the front grounds of the Palace. On a tall rock pedestal rising from the middle of the pool is a statue of a man wearing Roman robes. He is General Sir Fredrick Adam, leader of the 3rd Light Brigade in the Battle of Waterloo, and a popular Lord High Commissioner of Corfu because he commissioned the building of several important structures in Corfu during his tenure, including an aqueduct. The sculptor, Pavlos Prosalentis, has Adam's left hand gesturing towards the water as an indication of his work improving the city's infrastructure. The Palace, built by previous, and first, and aforementioned Lord High Commissioner Sir Thomas Maitland (1816-1824), served as his residence, but it was also the home of the Ionian Senate and recently founded Order of St. Michael and George, which honored distinguished military foreign service in the British Empire. It is now home to the Museum of Asian Art, which has 10,500 pieces collected by two Greek diplomats who were stationed in the Far East. Behind the Palace/Museum, in an area called Faliraki, there are some snack bars and restaurants. The Byzantine Museum, in this general area, was a privately-owned family chapel, donated to the state, now housing many 15th-19th century icons. Many of them are from the Cretan School, created by icon artists who fled Crete to Corfu after the Turks took Crete in 1646.The Metropolitan Church of Corfu is not far away. Just to the west of Faliraki is Arseniou Street, which curves along the northern seaside of Corfu Town, providing nice views of the Ionian Sea, the small island of Vidos, and Albania in the distance. 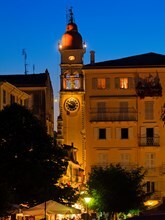 The Church of Saint Spyridon, also in this part Corfu Town, has the highest bell tower in the Ionian Islands, and is the best-known church in Corfu. 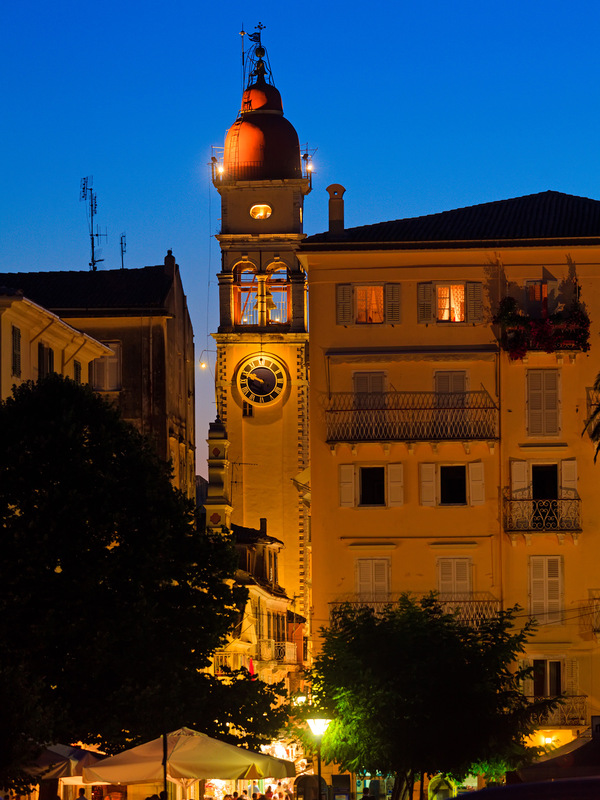 Built in the 1580's, it houses the remains of Corfu's patron saint, who was originally from Cyprus. Saint Spyridon participated in the Nicaean Council in 325, and died about 25 years later. His relics, which are believed to be miracle-working, were brought to Constantinople, and then shipped out to Corfu for safekeeping in 1453 when the Ottoman Turks captured the Byzantine capital. Saint Spyridon is credited with saving Corfu from devastation 4 times, most notably, during the Turkish siege of 1716 when he appeared of the walls of the city, frightening away the invaders. His relics are paraded through the streets of the city several times a year, accompanied by one of Corfu's marching bands, (filarmoniki) whose uniforms, with their rows of buttons on white suits, and long horse mane tassels on their helmets, resemble an Italian more than a Greek band. There are churches of other faiths as well, reflecting Corfu's ecumenical past, including a Catholic Cathedral, and an Anglican church housed in the former Ionian Parliament building and given as a gift to the Anglicans by the Greek government, who moved the original church location from the Old Fortress. There is a Greek Evangelical church, and there is a small synagogue, a gathering place for Corfu's 60 remaining Jews. Just above the Jewish quarter, towards the northwest corner of the city, is the New Fort, built over 73 years from 1572-1645. It provides some of the best panoramic views of the city. The Archeological Museum has artifacts from the original capital of Paleopolis, including a Gorgon pediment dated from 585 BC, taken from the Temple of Artemis, a 500 BC pediment featuring Dionysus and a young man at a symposium, and the late-7th century BC Lion of Menekrates, which is a funerary statue of a crouching lion. South of the old town, on a peninsula next to the Corfu International airport, is the area known as Kanoni, or Canon, named for a French canon, one of which remains, which were stationed at its highest point. It is now a scenic overlook complete with cafes for refreshments. Kanoni is a large district about two km south of the old town. From the hill one gets a magnificent view of the Vlacherna Monastery, at the end of a jetty sticking out of the southern end of the peninsula, and Pontikonisi (Mouse Island), so-called because of its small size. It is probably the most photographed area of Corfu. A five-minute boat ride takes you to the pocket-sized island, which has a small Byzantine-era chapel, and some snack bars. Pontikonisi is thought by some to be the ship of the Phaeacians, a god-like race who helped Odysseus reach his home of Ithaki, thus angering Poseidon, who turned their ship into stone. There is another, more ship-like rock off the west coast of Corfu, near Paleokastritsa, which is another candidate. A 300-meter causeway leads south from the end of the peninsula to the opposite area of Perama. The ruins of Paleopolis, the old capital, can be found here as well, as too the Mon Repos Villa museum, originally a summer residence of the Lord High Commissioner Fredrick Adam (1828-31), he of the Roman robes in front of the Palace of St. Michael and George in Corfu old town (see above). The Mons Repos Villa was seldom used, and a few years after its construction was turned over to King George I of the Hellenes as a summer residence. His family used it until the monarchy was abolished in 1967. Prince Philip, consort of Britain's Queen Elizabeth, was born here in 1921. The Villa is now owned by Greece and is being used as an archeological museum. South of Perama, 7 km south of Corfu Town, is the Achilleion Palace. It was designed and built by Austrian (Bavarian) empress Elizabeth (known as "Sisi), after she fell in love with Corfu subsequent to a visit to the Mon Repos Villa. It has repeated motifs- statues and paintings- of Sisi's favorite ancient Greek, Trojan War hero Achilles. Despite being a rather over-decorated place, the Achilleion Palace is beautiful and interesting. Sisi semi-retired here soon after her son's suicide and the collapse of her marriage. She learned Greek. She was eventually killed by an anarchist in Geneva in 1898. The Achilleion Palace was used as a military hospital during WWI, and there is a French soldiers' cemetery on the grounds. The James Bond Film For Your Eyes Only was filmed there. It is now a museum. Benitses is just down the coast from the Achilleion Palace. It has a new yacht marina, some Roman ruins, and a decent beach. Kavos is at the southern end of the island, and is currently the favorite place to go for young British tourists. It had a reputation for extreme partying, which is now changing, as it attempts to re-make its image into a more family-friendly one. Beaches are mostly sandy and organized. Issos is 32 km south of Corfu Town, on the west coast. It is an exceptionally beautiful beach with lots of golden sand, and clear water. It's family-friendly, offering water sports including windsurfing. Behind the strand of the beach is Corfu's most important wetland, Lake Korrission. This salt water lagoon has sand and rock dunes, deserted beaches, and a diverse plant and animal life. One of the most popular spots in Corfu. Agios Gordios (also called Ai Gordios) is 19 km southwest of Corfu Town, and due west of Benitses. It's another favorite for tourists. There are beautiful rock formations anchoring either end of the sandy beach. It is a popular resort with young people, especially its Pink Palace, a large hotel/hostel. But it's also a favorite with families, too. Off the south end of the beach, the Ortholinthos, a sheer rock coming out of the sea, was the site of a suicide in a short story by 19th century Greek writer Iakovos Polullas, in which the main character threw herself into the sea from the top of the Ortholinthos. Glyfada, one of the best sandy beaches on Corfu, can get crowded because it's near two hotel complexes. It's an organized beach with showers, sun beds, and water sports. It's 16 km west of Corfu Town. The beach has tree-studded cliffs and interesting rock formations. Agios Georgios Pagon is in half moon-shaped bay on the northwest coast of Corfu, about 40 km from Corfu Town. It is a lovely resort area located at the sea edge of a valley. The beach is perfect for families, providing plenty for kids to do as well as giving the adults a quiet environment. The beach is golden sand mixed with smooth pebbles. There are sun beds and umbrellas available, and the beach is fringed with cypress trees. There are opportunities to hike in the surrounding area, which includes historic villages and cliffs. Agios Stephanos Avliotes is a few kilometers north of Agios Georgios Pagon. The beach has tavernas, restaurants, and hotels. It is a quiet beach of golden sand, and a quiet spot for those seeking a peaceful getaway. Beach has a marina at one end for pleasure craft and fishing boats. Sidari Canal d' Amour is on the north coast, 36 km from Corfu Town. Its coves are both interesting and well-photographed. Its reputation is that of one of the best resort areas on the island. West of the beach is the Canal d' Amour (Channel of Love), a grouping of weathered sea-rock formations and coves unique in Corfu. Paths lead from formation to formation, which are sedimentary limestone, and layered in various shades of yellow, usually topped by vegetation. The local tradition has it that couples swimming through the channel will soon get married. Acharavi is also on the north coast. It is a long sand beach of 3 km featuring greenery, clear water, and a beautiful view north to the Ionian sea. It is not far from a nudist beach, so depending how one feels about that sort of thing, caution may be advised. On the other hand, the beach is very safe for children and has become a family favorite. It is a well-organized beach, close to town and all its amenities, including top-notch restaurants. Near the village of Kassiopi, on the eastern end of the wide, north side of Corfu, are 4 beaches which take their names from the village: Batari Kassiopi, which is small, well-organized, and a favorite with scuba divers, Kanoni Kassiopi, a beautifully picturesque place with interesting rock formations, Imerolias Kassiopi, a quiet place also good for diving, and Kalamionas Kassiopi , a nice beach that sometimes experiences strong winds. As you round the northern end of the island and begin to descend its east coast, you'll come to the oldest developed beach property on Corfu as you approach the capital. It is an area known as the "Kensington on the sea," for all the high-class British tourists and various celebrities who have frequented it over the years. But this area doesn't start until Ypsos, about halfway to Corfu town from the northeast tip of the island. Coming south, Kalami, 30 km north of Corfu Town, is a beach of smooth flat stones and turquoise-colored waters, Kalami is famous as the location of Lawrence Durrell's Prospero's Cell, an autobiographical work of fiction based here. The house Durrell stayed in during the 1930's is now a taverna. The beach is well-organized, offering sun beds, umbrellas, and water sports. The vegetation comes down to the edge of the sand, providing a nice background. There are rooms to rent in various buildings among the trees. Further south, Nissaki, one of the most beautiful of Corfu's beaches, is 22 km north of Corfu Town. Noted for its aquamarine, crystal-clear water, it is a small, secluded place offering a minimum of amenities. The bay protects the beach from high winds. The clear water allows unimpeded views of fish and other marine animals, and there are some nice tavernas nearby, as well as a dock for fishing boats, which sell their catch to the restaurants. At Ypsos, 15 km north of Corfu Town, the older, more developed, "Kensington on the sea" portion of the island begins. This long beach features gift shops, bars and the like on the other side of a road which parallels the beach. The shallow water is safe for small kids, but the road behind the beach can be noisy and busy. There is a good view of Mt. Pantokrator from the beach. The resorts and beaches from here down to Corfu tend to be the most un-Greek portion of Corfu, but are still rather nice if one's preference is to sun bathe, party, and eat well. These include Dassia, Kommeno, Gouvia, and Alykes. Over the years these beaches of mixed pebble and sand have toned things down a bit, and Dassia, in particular, is family friendly, despite the plethora of beach bars. They are all nice beaches whose chief advantage is their short distance from Corfu Town, rachable by local busses. Kommeno is where the elite have built their villas, and is a pleasant, secluded cove amidst the pine trees. Gouvia features the ruins of an 18th-century Venetian shipyard. Alykes is the last beach before Corfu Town, or conversely, the first beach, if you're heading north. It is a beautiful beach, and one of the island's most frequented due to its proximity to the capital. The water is shallow for the first 20 meters in, which makes is safe for children, and keeps the water warm for a longer period of the year. Eight km west of Corfu town is one of largest water parks in the world. Aqualand, near Agios Ioannis village. It covers 75,000 square meters (18,000 acres) features pools generating 7 different kinds of waves, as well as games with names like the Free Fall, the Deep Blue Kayak, the Black Hole, and Family Rafting. Mt. Pantokrator, impressive in its 915 meter height and visible from almost every corner of the island, is heavily forested with oaks, cedars, pines and other trees. Because of its height it provides fresh, cool air even on the hottest days. There is a cafe near its summit, from which all of Corfu is visible, much of the Albanian and Greek coast, and, on exceptionally clear days, Italy, over 100 km or about 70 miles away. A church dedicated to the Transfiguration of Christ and a telecommunications tower are at the mountain's highest point. The summit is reachable by foot from the village of Old Perithia, from which locally culled material for the church and an older monastery were hauled up the mountain. The village, dating from the 14th century, is a group of 130 houses and 8 churches and is on the Corfu Trail, about which more below. The Corfu Trail stretches from Kavos on the southern tip of the island, to its most northerly point, Agni, for a total length of 200 km. It opened in 2001. It goes through 17 traditional villages. Highlights include the ruins of the Arkoudilas Monastery, the Lefkimmi River, the Korission Lagoon, the Agia Deka deserted monastery, near a 576-meter overlook, and the Folk Museum of Sinaredes. Walking tours with accommodations are available. The Corfu Donkey Rescue is outside the village of Doukades, on the road to Paleokastritsa. The CDR was the idea of Englishwoman Judy Quinn, who found a donkey wandering near the village shortly after moving there. She gave it a home, and as time went by she acquired a number of former working donkeys who had been abandoned by their masters. Her idea is to give these donkeys a decent retirement. Visitors and volunteers are most welcome. The Folklore Museum of Central Corfu, in the village of Sinarades (on the Corfu Trail), is on the road to Agios Gordios beach from Corfu Town. It's exhibits, housed in a traditional village dwelling, include a raft made of cane fennel, a style in use from ancient times until recently, and birthing saddles village women used to helped facilitate labor. Kritika is a village in the municipal unit of Lefkimi, which is a group of villages in the southern sector of the island. Kritika was founded in the 16th century by refugees from Crete fleeing the recent takeover of their island by the Ottoman Turks. A little further north is Perivoli ("Orchard"), a village of 1,500 people mostly involved in agriculture, as the southern part of Corfu is the flattest section. It is a town of traditional stone houses surrounded by vineyards and olive orchards. Further north, at 23 km south of Corfu Town, is Agios Matheos, a village on the green, forested eastern slopes of a 450-meter mountain separating it from the Ionian coast. The mountain confusingly shares its name with the much higher Mt. Pantokrator to the north. It is also called the Gamillio (wedding) Mountain, after the wedding of the Argonaut Jason and Medea, in Medea's cave. Agios Matheos has some nice old churches and monasteries. A road leading out of the village takes you to Grava Cave. Gardiki Castle is a nearby 13th-century Byzantine castle, and the only surviving fortification of its kind in southern Corfu. Paleolithic remains, including primitive stone tools and animal bones, dating from 20,000 BC have been found on the site of the Castle and are now in the Archeological Museum in Corfu Town. Vatos is about 12 km west of Corfu Town, in the approximate center-west of the island. It is a short drive away from some of Corfu's best beaches, such as Glyfada and Pelekas. It is a small, peaceful village. The Ropa valley, which east and north of Vatos , is a dried lakebed which occupies much of central Corfu. The valley has olive orchards, herds of sheep, and hosts a variety of wildlife. Its flatness helps make it easy for bicyclists. The area is attractive for its authenticity, i.e., its lack of tourist development. Ano Korakiana is 19 km northeast of Corfu Town. This village was first settled during medieval times and still has an old, traditional atmosphere. Many upper class, noble families lived here, leaving behind some fine, well-preserved houses from the 1700's. The village did well during the 19th century British occupation of Corfu, with many residents working to help promote cultural aspects of the island. Its 900 residents work locally in shops and agriculture. The village has scenic, narrow streets and lanes. It is home to 37 churches, and has a tradition in the arts, particularly ceramics and folk music. Ipsos beach is a short 3 km drive west. At an elevation of nearly 700 meters, Strinilas is perched near the high point on Mt. Pantokrator. Its elevation keeps the air cool and refreshing during the summer. The views of the rest of Corfu and the surrounding sea and its islands are stunning. The local building material, smallish, hard stones used throughout the village, give it a different look than other Corfiot villages. Strinilas ferments a well-known local muscat (or "moschato") wine. There is a large elm in the main square of the city, under which shade the visitor can enjoy mezedes, muscat wine, and Greek coffee. The most highly developed, expensive, touristic parts of Corfu are north of Corfu Town, which attracted, and still attracts, European royalty and celebrities of various stripes. English poet Lawrence Durrell spent a few years here before the outbreak of WWII, along with his younger brother, naturalist Gerald Durrell. Both men write eloquently of the Corfu and its beauties. It is probably the least "Greek" area of Corfu, but a pleasant place to cook in the sun, and enjoy food, drink and music in the evening with one's sunburned fellow tourists. If you're lucky, you may spot a celebrity or two in the process.